April has been a busy one. I just got back from doing several workshops at FeatherFest in Galveston, then I spent three days guiding on the Santa Clara Ranch, and next week I’m off to South Padre Island for a spring migrant birds instructional photo tour. Immediately after that workshop, I will be leading a workshop on the Hoak Ranch near Ozona, Texas. The Caddo Lake Instructional Photo Tour had to be cancelled for this spring…just not enough participants. It has always been the most productive and fun of all the photo trips I lead, so it was especially difficult having to pull the plug. If you have been wanting to do that one, set aside some vacation time for the first week of May 2012. For those of you who shoot with Nikon equipment, I know of a couple of great lens buys. Contact Sherry ( sherhal@aol.com ). She has a Nikon 300 mm f4 and a Sigma 50-500 mm zoom, both less than a year old (the Sigma is only 2 months old) and like new. The lenses are excellent but her husband surprised her with a new Nikon 400 mm f2.8 just a few days ago, so she is eager to sell the other telephotos. Here are some shots captured on recent trips. The mud dauber photos were lots of fun because I got into the macro world of bees and wasps for a couple of hours (it was a slow day in the bird blind). Click in the upper right portion of the photo to enlarge if for a larger, sharper view and to move on to the next photo. 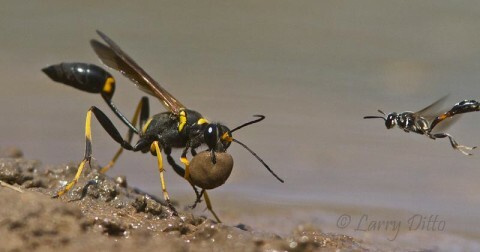 I got this shot with the 300 mm lens, 1.4 X teleconverter and 25 mm extension tube. To stop the motion, used the following settings: ISO 1250, 1/2000 sec. @ f10 with the Canon 7D camera. Of course, this is really a high speed, multi-flash type shot that should be done at f 22, but I made do with what I had. 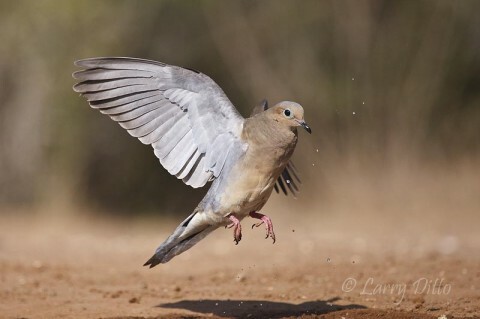 It usually takes 10-20 trys to get a good take off shot of birds at the water hole, but the reward is great when it all comes together. 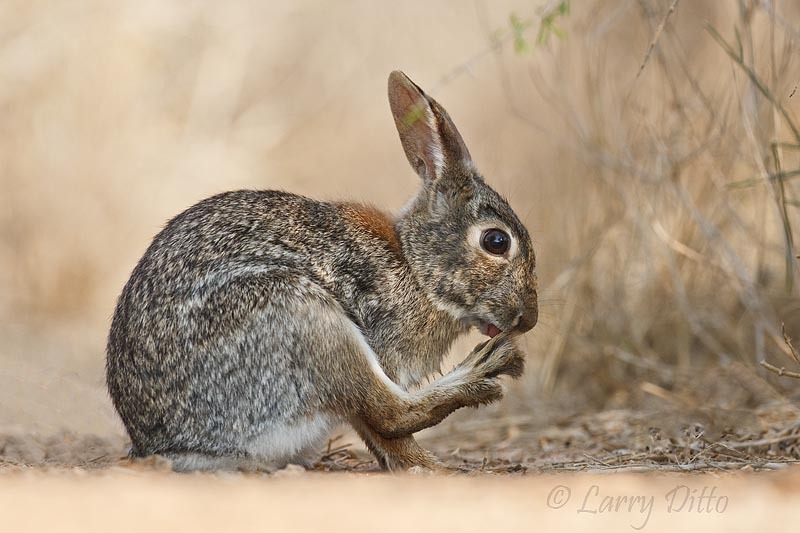 I shot this one with the Canon 1D Mark III and Canon 100-400 mm lens at 400 mm setting, 1/3200 sec. @ f 5.6 with the ISO set at 500. 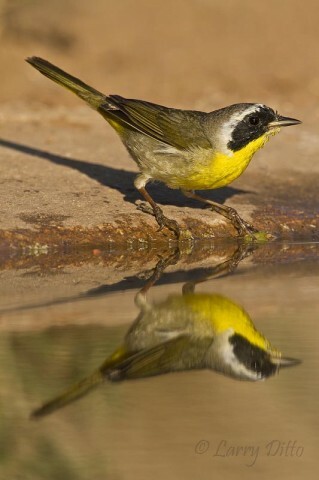 Common Yellowthroat about to bathe. This male common yellowthroat was very nervous, but eventually got a bath. 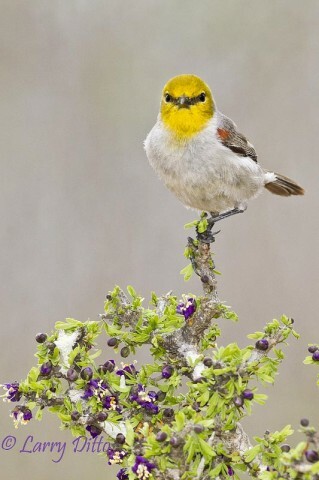 He is one of the early migrant songbirds to reach the Santa Clara Ranch this spring. Eastern Cottontail keeping those toenails clipped. Grooming is always tiring, so one should stretch out an relax after such hard work. 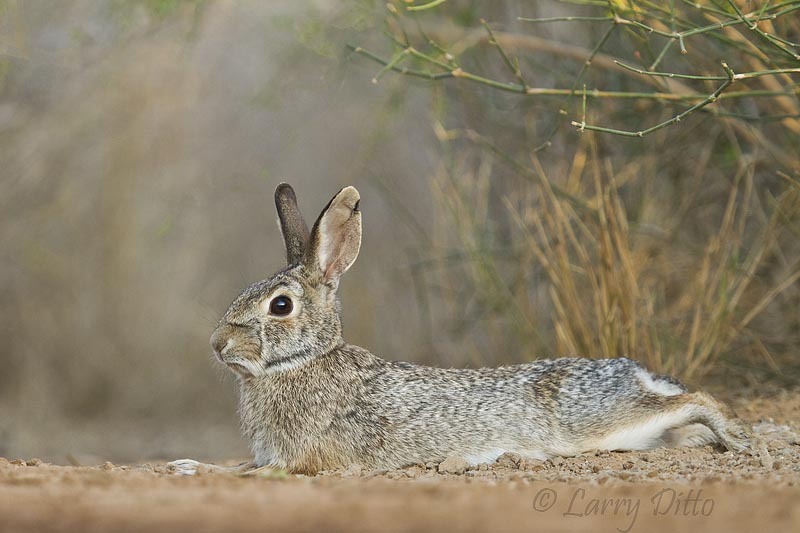 Eastern Cottontail resting in the cool dust of the south Texas desert brushlands. A handfull of corn isn't enough to satisfy two javelinas, so something has to give. 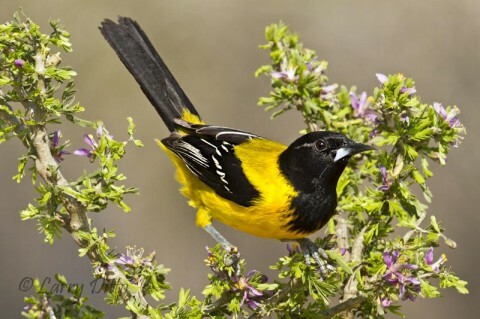 This Audubon's Oriole perched on one of the few guayacan plants to bloom this spring. 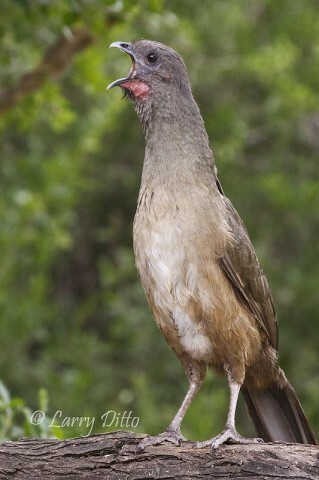 I had to hunt long and hard this spring for a guayacan bush with blooms that might make a good perch for bird portraits. The Audubon’s orioles have temporarily altered their winter routine and begun nest building. 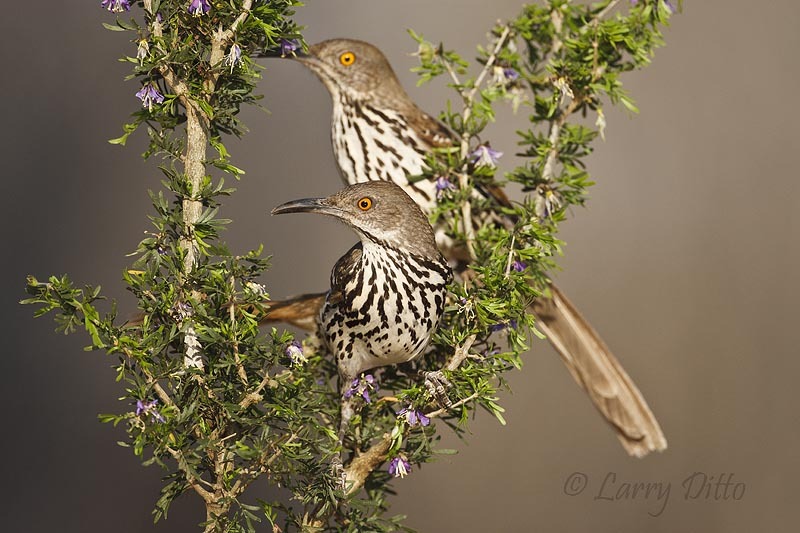 This pair of Long-billed Thrashers regularly visited the photo blind water hole, even while nest building. 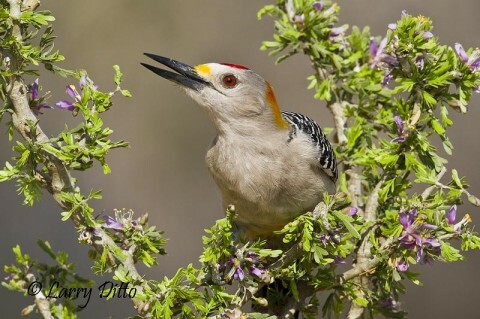 The Roel Ramirez Ranch at Roma, Texas still boasts large numbers of south Texas birds at the photo blinds. This colorful verdin looked stiking atop the blooming guayacan bush. 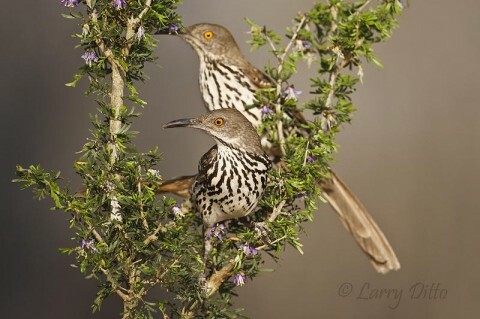 Water and fresh orange slices attract the guys to south Texas photo blinds. Golden-fronted Woodpeckers readily land on guayacan bush perches, too. This coming week, we hope to see lots of Royal terns and songbirds at the South Padre Island Photo Tour. During the South Padre Island Photo Tour, we plan to get eye-to-eye with the Laguna Madre beach terns, shorebirds, and gulls. 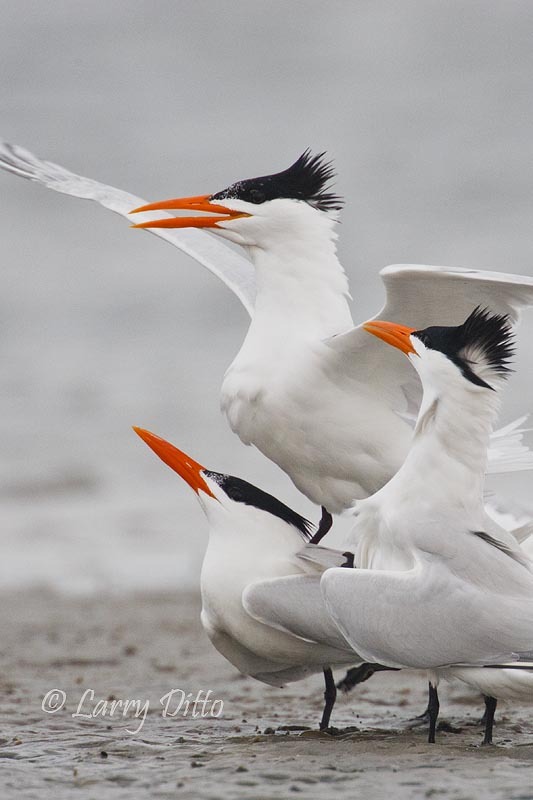 These breeding terns were captured with the Canon 1D Mark III and 500 mm IS lens atop a bean bag cradled in a frisbee. I got a little damp on the underside, but it was fun. Nevertheless, an 80″ plastic body-skid for beach photography would be nice. Thank you, Lord, for your beautiful creation. Okay . . . 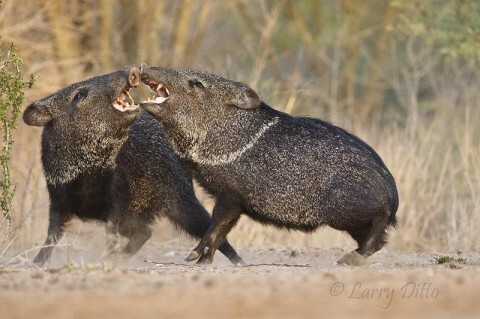 I really like the Royal Terns shot, and the two javelinas fighting . . . animal behavior. Can’t wait to get down there.